A recent article in Rolling Stone magazine, entitled “Meet the Private Companies Helping Cops Spy on Protesters,” comes close to scratching the surface by identifying the four major security contractors that have been aggressively hawking their invasive surveillance products at various trade shows and police conferences throughout the nation. However, they fail to mention that at least two of those companies are owned and operated by members of a foreign nation with a long and notorious history of spying on the U.S. government and its citizens. Among them is NICE Systems, Ltd., an Israel-based company founded in 1986 by seven “Israeli ex-army colleagues.” NICE’s current CEO is Zeevi Bregman, who formerly helmed Comverse Technology, Inc., an Israeli-run private telecommunications firm that provides wiretapping equipment to U.S. law enforcement. More recently, Comverse subsidiary Verint Systems, Inc. has been linked to the current NSA spy scandal. 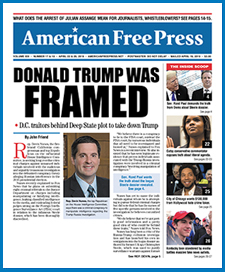 AMERICAN FREE PRESS has previously reported on how the company was hired by the feds to wiretap U.S. telecommunications networks and even offered back-door access to major U.S. technology companies like Facebook, Microsoft and Google. According to foreign trade portal Israel Gateway, NICE Systems products are already being used at the Statue of Liberty and the New Jersey Transit System. The other Israeli-owned security firm referenced in Rolling Stone is 3i-MIND, which is profiled in the below article. 3i-MIND’s founder and CEO is Israeli-born billionaire Mati Kochavi, who also owns AGT International, a security firm managed by a team of retired Israeli generals and Mossad agents, according to an article in Le Figaro. Though AGT has only been in business since 2007, it has already secured $8B in contracts and has become a leading supplier of surveillance technologies to the governments of India, the Netherlands, Brazil, China, Singapore, the United Arab Emirates and others. Although Kochavi wants his staff and clients to enjoy full-spectrum intelligence gathering capabilities, he doesn’t believe the general public should be afforded the same. In 2011, Kochavi and former President Bill Clinton appeared together in a CNBC interview to push for the creation of a regulatory agency that would prevent “misinformation and rumors” from being spread over the Internet. It’s certain that if Kochavi had his way, real news organizations like AMERICAN FREE PRESS would be given a “zero” credibility rating. Israeli security companies like AGT and NICE Systems can only survive if their sordid pasts are concealed from public scrutiny. And that’s precisely why AFP will continue to expose them at every opportunity. A multinational security firm with ties to Israeli intelligence is providing U.S. law enforcement with intrusive surveillance tools to spy on American citizens and track the movements of political activists. According to the above-mentioned Rolling Stone article, for-hire intelligence group 3i-MIND has been found peddling their highly advanced data-mining system at various security trade shows and police conferences throughout the nation. The product, marketed to law enforcement as “OpenMIND,” scours the so-called “deep web”—that 80% of the Internet inaccessible to other search engines—for insights about upcoming demonstrations, identifies and collects information on political activists and monitors their activities in real-time. “Your insight is distributed to the local police force warning them that the political rally may turn violent and potentially thwarting the violence before it occurs,” says promotional material for the product on the 3i-MIND website. Very little is revealed about 3i-MIND in the Rolling Stone article. They don’t mention that its founder and CEO is Israeli-born billionaire Mati Kochavi, who made his fortune in real estate after serving as an intelligence operative for the Israel Defense Forces (IDF). Kochavi’s companies reportedly employ dozens of former IDF, Mossad and Shin Bet security service officials, including Major General Amos Malka, who headed Israel’s Military Intelligence from 1998-2001. This isn’t the first time an Israeli-linked company has been implicated in spying on American activists exercising their First Amendment rights. In 2010, public outcry forced the Commonwealth of Pennsylvania to end a contract with the Institute of Terrorism Research and Response after it was discovered that the Jerusalem-based intelligence group used the Internet to spy on peaceful protestors and then generated misleading “terror bulletins” on their activities, which were in turn distributed to Pennsylvania law enforcement agencies. If American citizens are upset that the federal government is eavesdropping on their communications, they should be more than outraged that proxies of an oppressive and untrustworthy foreign nation like Israel are helping their local police departments do the exact same thing.